Yesterday it was an Open studio day at my workshop with lots of visitors. Trish and I made four white glass vessels and one black and grey. It was a beautiful warm summer day and afterwards we had a long swim in the lake. Vessel no.88 returned with Johanna from China and more about that journey later. Many thanks to photographer Marianne Lindgren. Do you want to see more great pics from our area look at her website Fjällbilder. The film was made as a collaboration between Umeå2014, Kreator, Lampray and Åsa Simma. On the 14th of January I will participate in the opening day, with presentations and dinner at Västerbottensdagarna Grand Hotel Stockholm. You can find me in the showroom and see images from the art project 100 MIGRATORY. 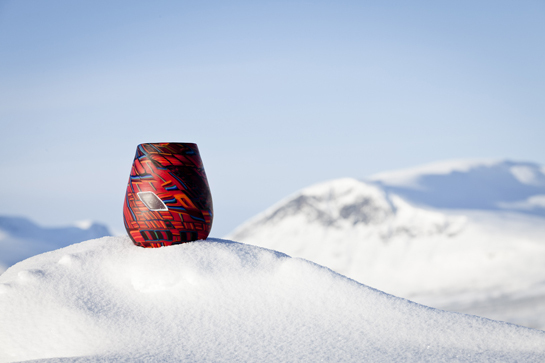 Glass vessel no.53/100M is on display in the showroom during this day – the same vessel you can see above in this beautiful image by Carl-Johan Utsi located close to Sijddojávrre lake in February 2012. There is a special story surrounding vessel no. 53/100M. After blowing and annealing the vessels in the kiln I coldwork the surface of the glass by grinding it with diamond wheels. I do this to make the surface more light absorbant instead of reflective. Some might think I’m mad to spend so much time on each of these 100 vessels as I start with a 100 grit wheel, followed by a 360 wheel and finally polish with a 600 diamond cutting wheel. For me it is essential for the final impression of the work. However, four of the hundered vessels have a reflective, not wheelcut, surface. So, this vessel no.53 is just as important and part of the project as any of the other vessels. Vessel no. 9/100M has arrived to Australia. You can read about it on the webpage of the Embassy of Sweden in Canberra. The vessel is made as a murrini pickup in my glass workshop and studio in Tärnaby north Sweden. 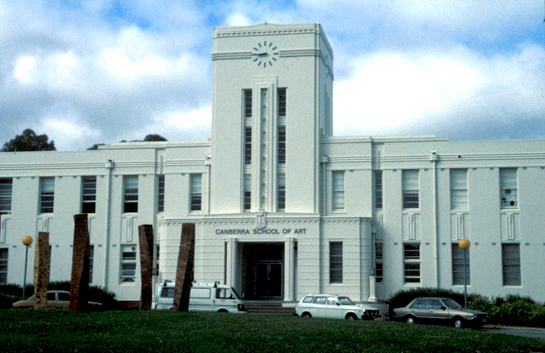 The technique to pull murrini canes in Bullseye glass and make murrini pickups in the hot shop I learnt during my years of studies at Canberra School of Art in the second half of the 90´s. I can never forget the first time Giles Bettison (a student a few years ahead of me in the workshop) instructed me of how to make my first murrini pick-up. It was a very special moment and that tiny (and pretty ugly) 1st murrini pick-up is the only glass I really treasure and even have on display in our private home. I am forever thankful to our teachers at the workshop; the warm loving artist and excellent professor Stephen Procter (who sadly passed away only a few years after my graduation), our teacher and glass artist Jane Bruce and technician and sculptor Phil Spelman. They were a great team that always questioned our choice of material and techniques at the same time they helped us sharpen our thoughts of what we really wanted to express and why. To express what I want in my art, the school (its staff and other students) helped me discover the techniques to pull canes in Bullseye glass, to do murrini roll-ups and pick-ups in the hotshop and the skills of surface grinding and wheel cutting of the glass. Techniques all part of this vessel no. 9/100M, now on dispay at the Embassy of Sweden (reception) in Canberra, and part of this extensive art project 100 MIGRATORY. This vessel (and images from its journey to Australia) will be returned to me in Sweden sometimes around April/May 2013. All hundered vessels and images from their journeys in the Swedish winter mountains and around the world will be part of the final exhibition at the Museum of Västerbotten Umeå Sweden January – May 2014 – the year Umeå is selected to be the European Captial of Culture. So if you’re in Canberra now and want to have a look – visit the Embassy of Sweden.